An animal rights activist has posted a video of her comforting a calf before it is apparently led to the abattoir. 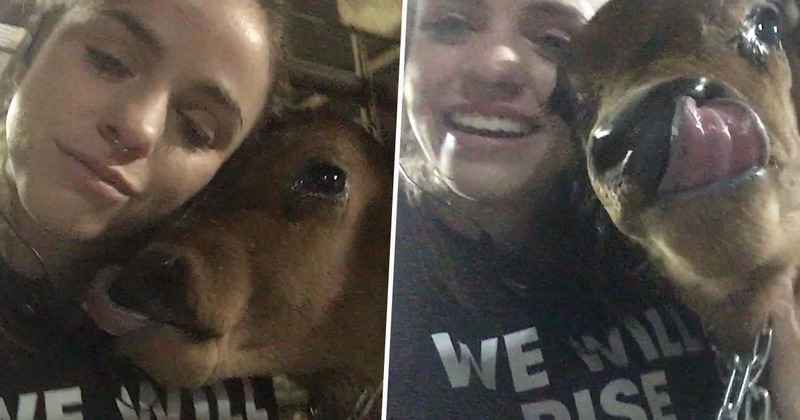 The footage shows activist Alix Livingstone cradling the baby cow while sobbing. Alix, 23, reportedly stormed a slaughterhouse and chained herself to railings next to the animal, while another activist chained themselves directly to a calf in a bid to get it released. Alix tried to negotiate the release of two Bobby calves – which are less than 30 days old and have been separated from their mothers – but the slaughterhouse refused to hand them over after hours of negotiations. CA Sinclair slaughterhouse in Victoria, south east Australia, told her that they would forcibly remove her from the premises if she did not voluntarily leave. Alix comforted the cow and sobbed while she cradled it in her arms, filming herself with the calf in the process. Alix works as an investigator for Aussie Farms where she investigates farms and slaughterhouses to raise awareness of the plight of animals. While rescuing them is not always the main agenda, she does get the chance to take some home, comforting the animals and spending time with them. I get to know them as individuals and it’s heartbreaking to know their fate if they are not going to be rescued. Alix, from Melbourne, has been a vegan for over two years. I was inspired by other activists I saw online. I felt I needed to do more than just being vegan. I needed to join the fight for animal liberation. Veganism is not causing harm to the most vulnerable creatures on the planet, showing compassion and being kind to all sentient beings. I hope that those who have not yet made the connection, will soon realise that even though they are different, they share the ability to suffer, feel love and joy. Earlier this year, a provocative carnivore held his own kind of protest by eating a raw steak outside a vegan food festival. The ponytailed rabble-rouser, wearing a black vest bearing the slogan ‘Go vegan and die’ was questioned by cops after disgusted vegans complained about his protest. They said blood was ‘literally dripping off the piece of meat’ as vegans queued up to enter the Vegan Food Festival in the capital city of Amsterdam, Netherlands. While it is of course not forbidden to eat raw meat, it was of course a shocking sight because there was a puddle of blood and fat. Besides, there were lots of elderly people and children. At that time a special children’s programme was going on.